Are You Going With Me?, 2010-2012. 14x26 inches. Oil on linen. Res Ipsa proudly presents Are You Going With Me?, an exhibition of new paintings by Mitchell Johnson. An opening reception will be held in connection with Art Murmur’s First Friday series on May 4, 2012 from 6pm to 9pm. On Saturday, May 12, 2012, at 1:30pm, Johnson will give an artist talk in the gallery. The exhibition will be on display from May 4, 2012, through June 15, 2012. While the show is on view, the gallery will be open Saturdays from 1-4pm, and also by appointment. Known primarily as a colorist working in the vein of the Bay Area Figurative Movement, Johnson has for many years simultaneously pursued two distinct bodies of work: one representational and the other purely abstract. Recently, Johnson’s work has taken an exciting new turn, combining the two approaches on individual canvases. Are You Going With Me? is the first exhibition of this new body of work. JOHNSON: No matter where my family was living: Kansas, New York, Virginia… whenever I walked in the door after school I was greeted by the sound of my mother teaching piano. Now that my son, Luca, plays piano I am reminded that I grew up with a remarkable range of music around me – from the Beethoven, Handel and Satie that was inevitably there – to the Led Zeppelin and Pat Metheny that I chose on my own. For all of the possibility of color and shape that I explore in my paintings, there is also a powerful influence of music assisting in my efforts to reach new territory. I have named one of the paintings in this show Are You Going with Me? after the 1982 composition from the Pat Metheny Group because of the remarkable journey the painting traveled before reaching its current stasis. Recently, when Luca was practicing Fur Elise for an upcoming recital, I surprised him (and myself) as I joined him on the piano bench and playfully layered strange notes on top of his piece just as I had done with my mother when I was Luca’s age. It occurred to me that the collage of flat colors I have been applying over my landscapes and compositions is the visual equivalent to the strange sounds Luca and I were generating as we made nonsense of Beethoven. We weren’t being disrespectful or even trying to be humorous. Instead, there was something very complex, adventurous and exciting about the result, and that was enough. 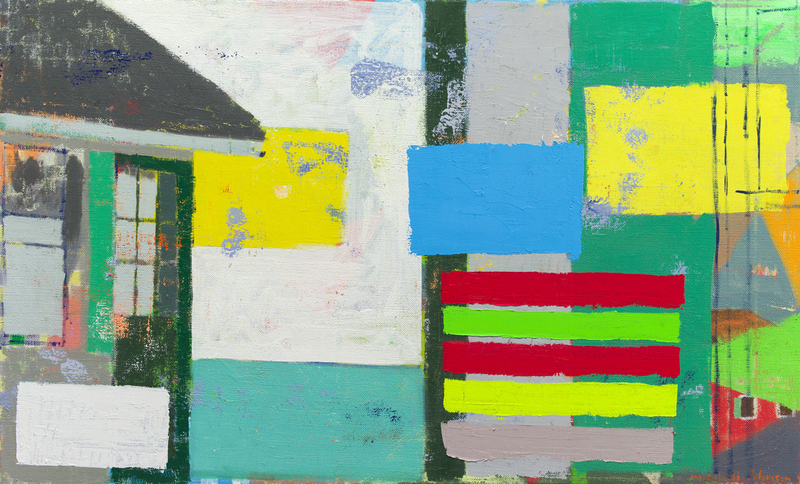 In these new paintings, the collaged flat areas of color disrupt a literal reading of the landscapes underneath, playing the role of Johnson’s improvised random notes over his son’s music. While the representational images and color grids battle for prominence, it is difficult to determine whether the color is providing context for the image or the image is providing context for the color. Click here to listen to a September, 2009, conversation between Mitchell Johnson and art historian Peter Selz about the relationship between Johnson’s representational and abstract work. This interview is part of the Smithsonian Archives of American Art. Click here to see an interview of Johnson, published on the Huffington Post, in which Professor John Seed talks with Johnson about Are You Going With Me? Back to: Are You Going With Me?